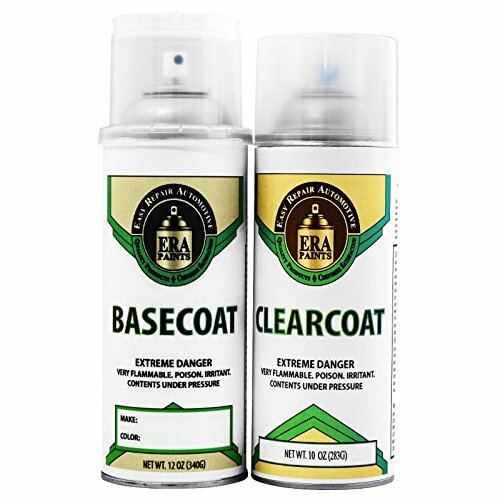 ERA Paints provide easy do-it-yourself solutions for many automotive paint needs. We pride ourselves on premium-quality Made-in-America products/accessories competitive pricing and world-class customer service which includes a conditional 30-day money-back guarantee. Touch up orders are shipped USPS First Class Mail. However note that spray paint orders can only ship only via ground service (federal regulations) so be aware that it takes longer for spray paint order deliveries (up to 10 days). We offer environmentally-safe low-VOC urethane paint that meets all state environmental requirements and are saleable in all American states and most US Territories. However, due to shipping limitations indicated above we do not sell to Canada/APO/FPO and cannot sell/ship aerosol spray cans to Alaska Hawaii or US Territories. NOTE: We hand-mix and sell OEM-spec paint (the paint color your car was manufactured with). This color may vary slightly from your vehicle's paint color due to vehicle paint fading. We do not warranty paint matching issues due to paint fade or failure to blend paint between auto body panels. Automotive Spray Paint with Clearcoat purchase includes one 12 ounce (by volume) aerosol can of spray paint (with premium adjustable EZ Touch nozzle) that matches your vehicle's paint code; a paint test-match card; one 10 ounce (by volume) aerosol (by volume) can of spray '1K' clear coat and documentation (application instructions/safety info/warranty-returns policy). Our ratings can be found on our Amazon 'ERA Paints Profile' (look for 'Ships from and sold by ERA Paints' above). One spray (basecoat) paint can generally has enough paint to fully paint a 4ft X 4ft area (2 coats, blending etc), typically this is enough to fully paint a door or a small fender. Two spray paint cans are generally required to repaint a bumper, entire hood, quarter panel, roof or larger fenders. If you have any questions about this product by ERA Paints, contact us by completing and submitting the form below. If you are looking for a specif part number, please include it with your message.